You Don’t Have to be Training for Wimbledon to Get Tennis Elbow! We see a lot of tennis elbow cases at Focus Bodywork, and so far none of these cases have been in individuals who play racquet sports. Mostly our tennis elbow clients are desk jockeys who moonlight as climbers, but athletes who uses their arms are suspect! Tennis elbow is the common name for lateral epicondylitis. This tendonitis (acute or trauma causes) or tendonopathy (chronic degradation of the tissue from repeat assaults) refers to inflammation of the tendon on the outside elbow. Most of the muscles in the forearm that extend the wrist and open the fingers merge to form a common extensor tendon that inserts on the outside of the elbow. Tendonitis develops from a simple motion that is repeated ad nauseaum such as flicking a gear lever on a road bike, or a short duration but intense effort that is abnormal such as repeating an odd bouldering move twenty times one afternoon. Seldom does an injury occur at a notable instant. Usually the lateral elbow is tender the day after use. It is easy to be seduced into thinking a few days of rest has healed the injury. Often it feels okay, but on returning to use it is tight or mildly painful for the first few minutes of use. The elbow may feel like it “warms-up” after a bit of use, and continuing activity may lead one to believe they are not making the injury worse. However, a few hours after the athlete has cooled down, the elbow is tender and painful again! Rest alone rarely allows a tendonitis to heal. You have pain on the bony outside of your elbow and you think its lateral epicondylitis, but you are confused – you can only cite repeated gripping activities as the culprit motion, not repeatedly opening your hand and extending your wrist. What is going on here? Actions of the hands are quite complex, requiring a symphony of muscle firing orders, varying muscle tensions and speeds of muscle contractions in order to do even the simplest of tasks such as holding a fork. Just imagine what has to happen in order to leverage a body in motion upwards when you are pinching a quartzite crystal on a rock face! Forearm muscle synchronization requires the wrist and hand flexors (the muscles on the pale part of your arm that insert on the medial/inside elbow and allow you to grip) to work in tandem with the extensors. If a flexor is contracting to grip, its antagonist extensor is resisting being lengthened (eccentric contraction) to provide a fine-tuned squeeze on the object instead of crushing it. Eccentric muscle contraction is more demanding on muscles, which causes the extensors to work harder than the flexors. You can experience this for yourself by feeling your forearm. 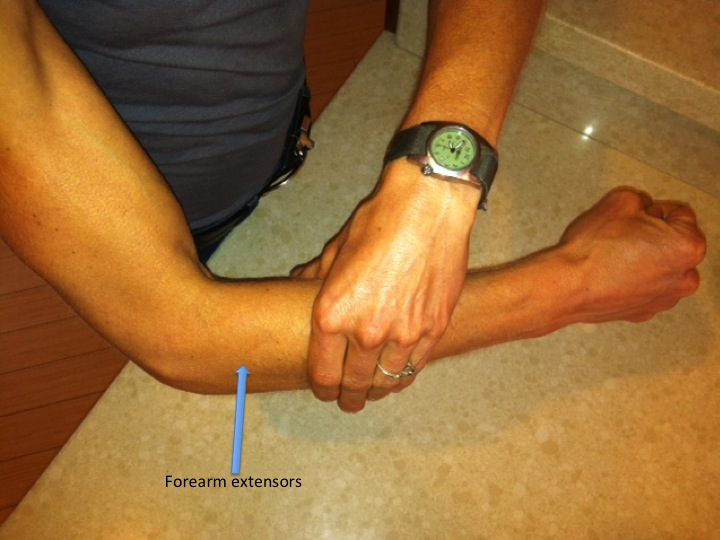 The extensors (on the tan part of your forearm) are bigger than the flexors (on the pale part of your arm). Now gently grip your forearm around the thickest part (where the bulk of the muscles are) and squeeze the hand of the arm you are gripping. You should feel more muscles contracting and to a greater extent in the extensor group (on top/tan) than in the flexors (below/pale). The extensors do more work than the flexors when gripping. 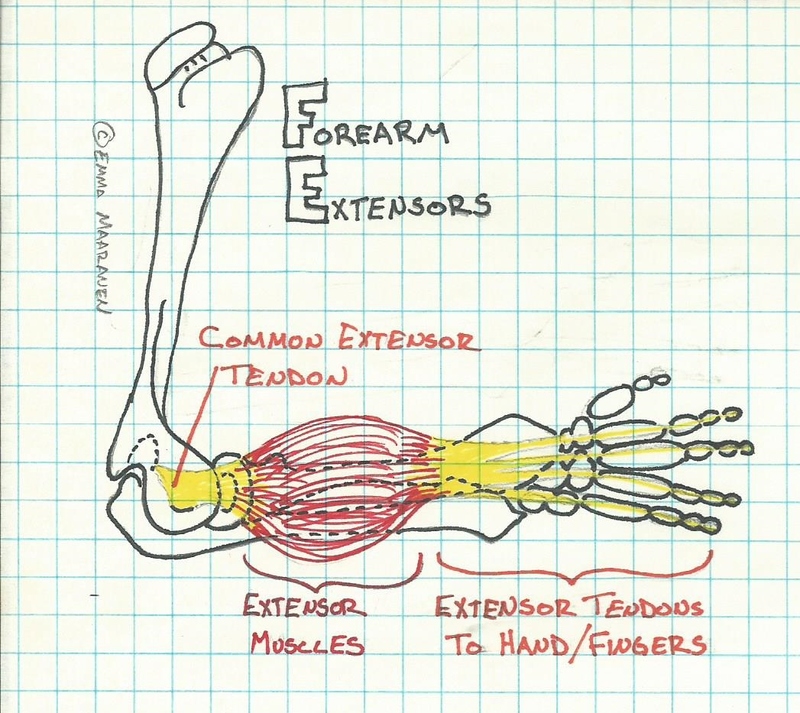 This is why forearm extensors can be injured when you perform primarily flexion activities. Once your lateral epicondylitis has been diagnosed, treatment usually involves targeted eccentric strengthening of the forearm extensors, range of motion exercises, rest from strenuous use, and ice treatments. Most of the time this is all that is required to completely heal. If the injury is recent, healing should take about six weeks. If you have been aggravating the injury by pushing through the pain for a while, healing may take up to six months. More serious or chronic cases may be treated with ultrasound, e-stim or a cortisone injection. However, we see a lot of these injuries that are NOT healing with the standard medical interventions! In these incidences there are often other causes complicating or contributing to the tendonitis. We love to help you identify these factors; either after standard treatment is not resolving the injury or, better yet, congruently with standard care! Over training can cause excessive damage to fascia (think nori wrap for muscles) in excess of what the body can repair between training sessions. Damaged fascia becomes tacky and can stick muscles together so that when you need to only use one, both muscles have to fire. Muscles are overworked, tighten, and yank the tendon into a lengthened position. Tendons do not like to be lengthened for a long period of time and will become inflamed. If the forearm fascia is sticky, it is difficult to resolve tendonitis until the fascia has been mobilized. When the muscles in the forearm have been tight for a while, they can compress the joints that they cross: the elbow, wrist and finger joints. When joints are compressed they can become inflamed and range of motion is lost. The muscles of the forearm will compensate and overwork through the reduced range of motion. This is not an ideal situation for healing a tendon, so we release the hypertonic (too tight) muscles thus allowing full range of motion to the joints and eliminating compensatory muscle firing. 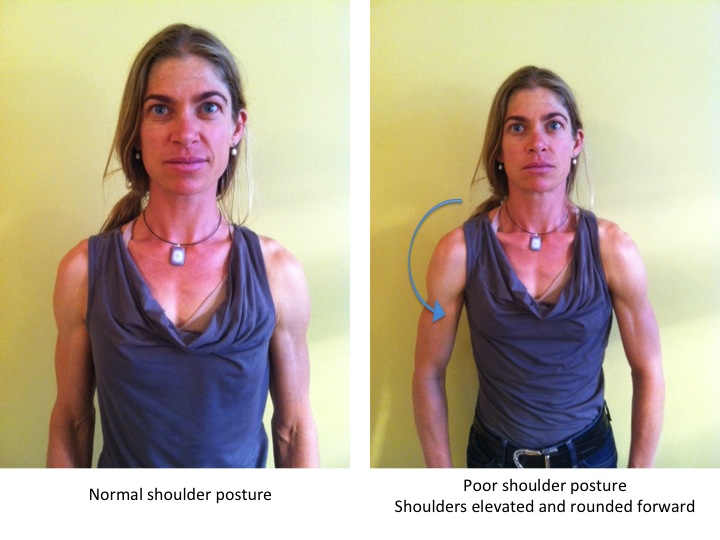 Shoulder posture can also impede elbow range of motion. If your shoulders are rounded forward and/or elevated, your elbows will stay bent when relaxed instead of hanging strait down from the shoulder. This causes the forearm muscles to shorten, work poorly and excessively tension the tendons. This posture issue can often be addressed by balancing the muscle tension of the shoulder girdle and upper thorasic spine. Often this requires a combination of massage, targeted exercises to strengthen, lengthen or restore range of motion, and changing habits such as slumping at your desk all day. 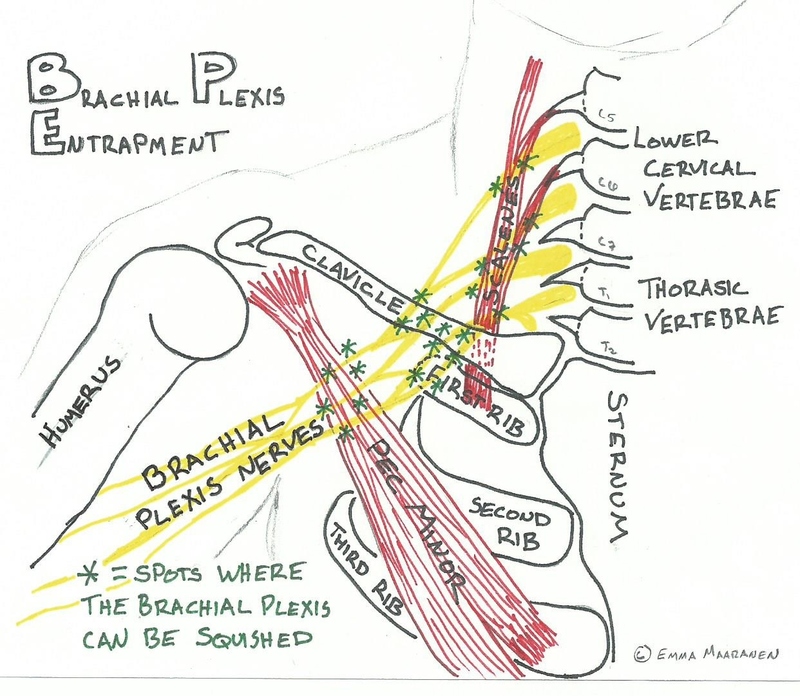 Entrapment of the brachial plexis (nerve line down the arm) may be occurring. Nerves that tell the muscles of the forearm what to do can be squished or rubbed on constantly at some spot as the nerve traverses from the spinal column at the lower neck and upper back to the elbow. When a nerve is stimulated constantly it will send a dull message to the muscle tissue it acts upon telling it to contract just a little bit all the time. This is exhausting to the muscle; it will shorten and the tendon will be overstretched. There are three common spots this nerve line is compressed at: below the scalenes (front of neck muscles used to inspire), under the clavicle (the collar bone) and upper rib cage can be too close to each other due to biomechanical factors and/or muscle tension), or under the pec minor muscle which becomes tight and short with slumped shoulder posture. Again, massage and targeted training will relieve the pressure on the nerve. Occasionally there is pressure on the nerve as it exits the spinal column at the lower neck or upper back. This can be from disk or bony changes of the spine. If we suspect that this is the issue that may be complicating your tennis elbow, we refer you to a specialist to be evaluated and can then aid your medical team in addressing these problems. Whenever we work with a client with lateral epicoldylitis we treat not only the tendonitis but address any and all other factors that may be complicating or causing the injury. This ensures a speedy recovery and reduces the likelihood of a repeat injury. Your elbow may feel so fantastic once we have helped it heal that you pick up tennis! 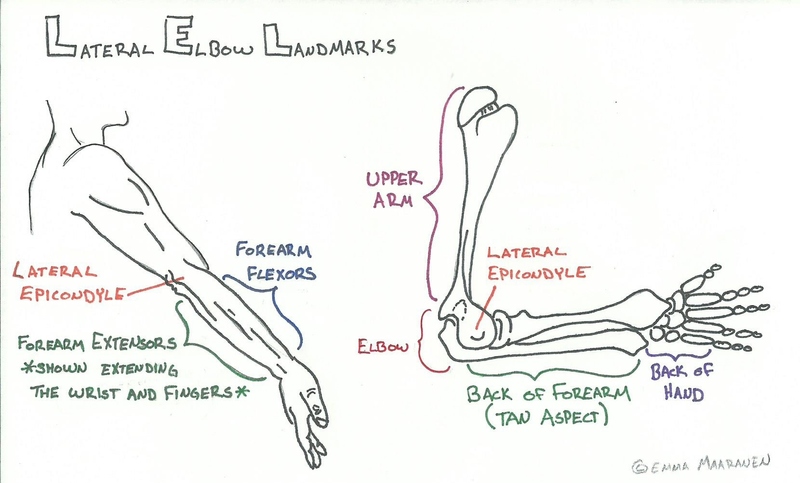 This entry was posted in elbow, Shoulder and tagged Elbow Injury, Forearm Flexors, Lateral Epicondylitis, Tennis Elbow by focusbodywork. Bookmark the permalink.